It's easy to look at this game and think it looks a little too precious. Kirby's Epic Yarn is actually the perfect level of precious, coming off as sweet, rather than saccharine. The central conceit - that we're in Patch Land, where the world consists of yarn, fabric, and sewing notions - is stunningly realized in the game's design. The most important aspect of the premise is the brilliant way it enhances gameplay. Yarn is obviously the element that sees the most play, but the sewing notions and doo-dads are a fantastic integration. The game keeps you swinging from buttons, unzipping new worlds, and pulling drawstrings to create shortcuts. That's not to say that the use of yarn isn't sharp, because is it ever: The ability to unravel enemies with ease and transform into anything from a submarine to a fire truck makes every level an exciting new adventure. In terms of level design, the world is detailed down to the last stitch. Worlds with water are particularly well realized; watching the yarn water "flow" can be almost hypnotic. Cooperative gameplay, in particular, cleverly serves the premise. As Kirby and Prince Fluff, players can ball each other up to toss at button-eyed enemies and fling each other to dizzying heights to reach new areas of play. The game is quite relaxing, even in its challenging bits. This is helped by the soothing soundtrack, which is appropriately peppy without being obtrusive. Kirby's Epic Yarn masterfully realizes a clever concept, and does so in a delightful and playable way. 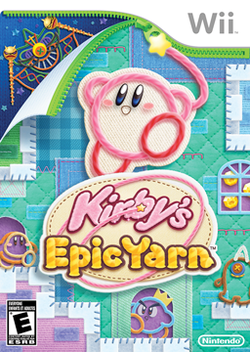 Kirby's Epic Yarn has a place as one of our nominees for Game of the Year all stitched up.